Reflex-Suppressed CZ Scorpion EVO III Micro S2 Reflex 9mm SMG/PDW / Pistol/SBR for Military SOF Dynamic CQB/CQC and Civilian Tactical Home Defense! (Video!) | DefenseReview.com (DR): An online tactical technology and military defense technology magazine with particular focus on the latest and greatest tactical firearms news (tactical gun news), tactical gear news and tactical shooting news. 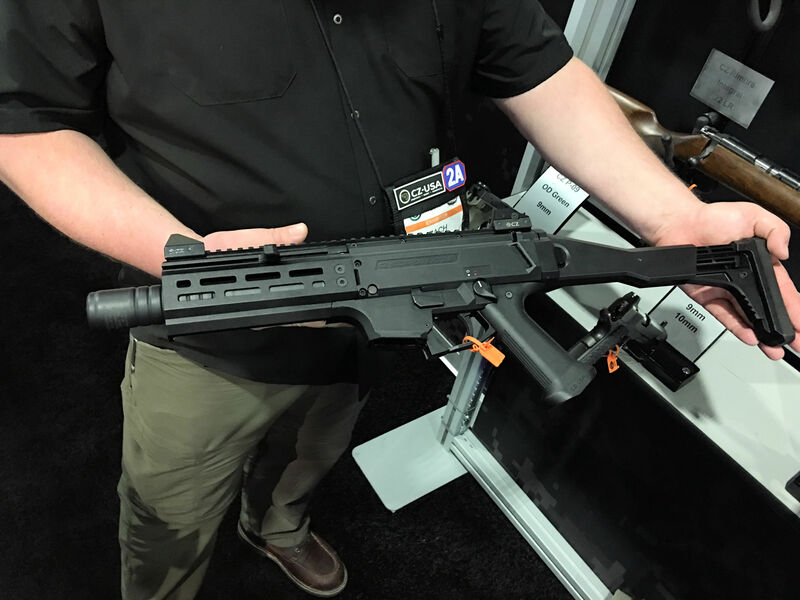 CZ USA keeps intelligently and diligently developing their combat/tactical firearms and generally upping their game, and a prime example is the new reflex-suppressed CZ Scorpion EVO III (or, EVO 3) Micro S2 Reflex 9mm pistol/SBR (Short Barreled Rifle) in semi-auto only configuration, or SMG/personal defense weapon (PDW) in select-fire/full-auto config, This latest product sports a CZ S2 Ti Reflex (over-the-barrel) muzzle can (silencer/sound suppressor) attached to it for pleasant, quiet operation, and silent, deadly fun. DefenseReview’s (DR) already covered the CZ Scorpion EVO 3 S1. 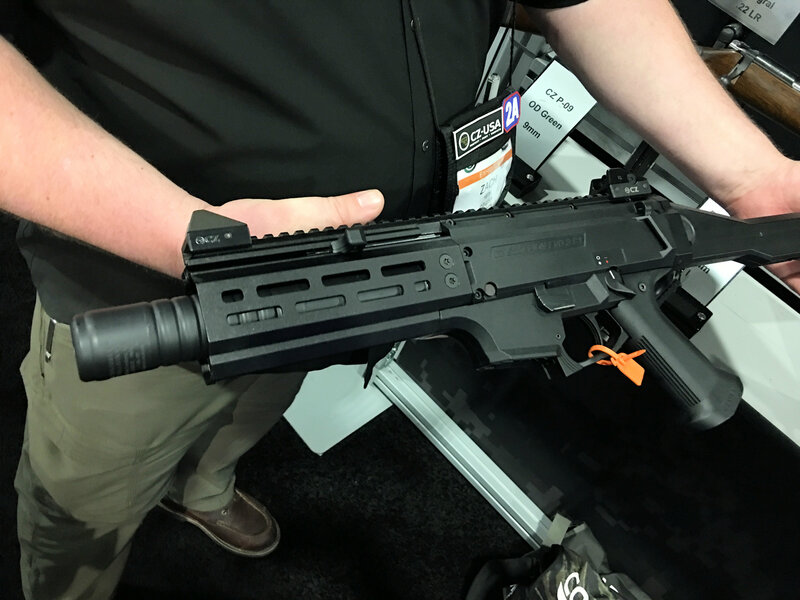 The CZ Scorprion EVO 3 S2 basically shortens that weapons package using the CZ Scorpion EVO III Micro as base gun. So, now you’ve got something even smaller, lighter, and more maneuverable inside structures. Military Special Operations Forces (SOF) missions and a law enforcement (LE) SWAT operations aren’t the only situations were silenced weapons can be advantageous. 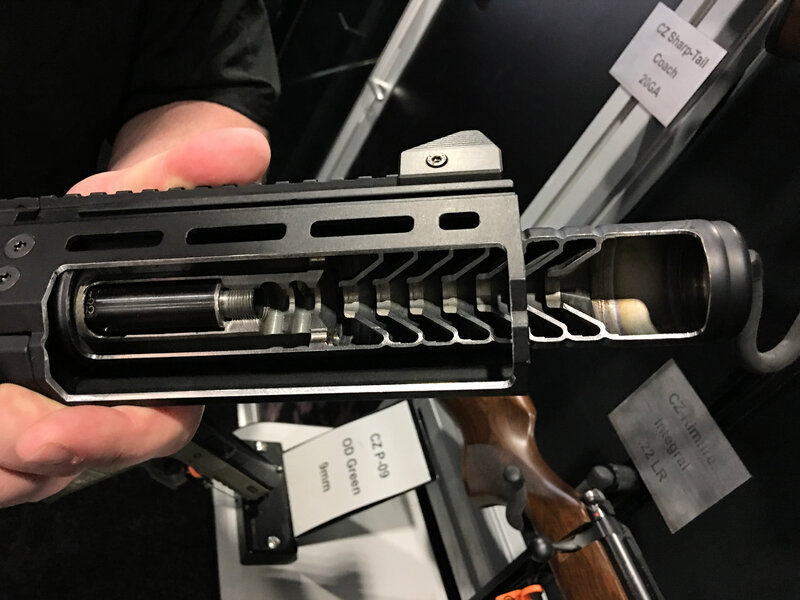 Many civilian tactical shooters who live in SBR and suppressor-friendly NFA states are now choosing suppressed 5.56mm NATO (5.56x45mm NATO)/.223 Rem. 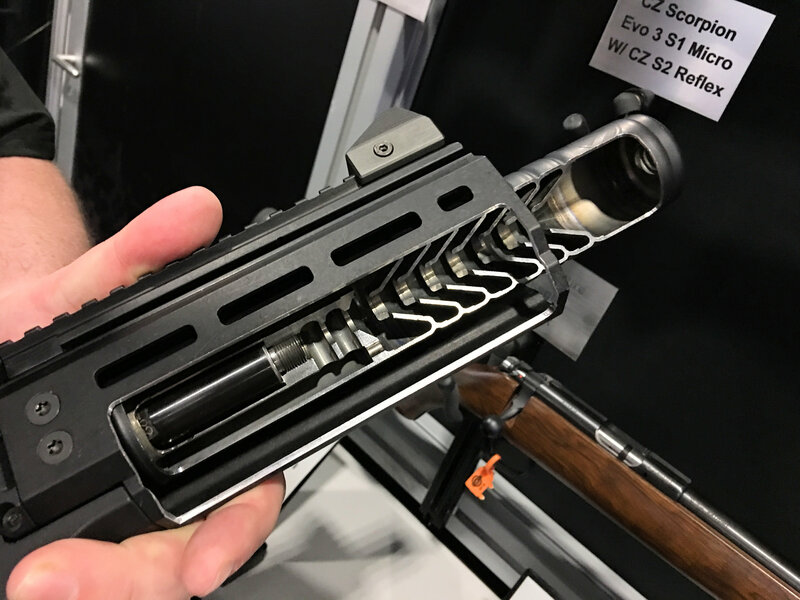 and 9mm carbines and SBRs as their bedside home-defense gun, since their much easier on the ears inside structures, and mitigating the need to don hearing pro before you take care of business. Military SOF and SWAT teams enjoy the enhanced tactical comms (communications) and public-friendly aspect of suppressed weapons. Suppressed weapons are less likely to scare and/or wake up the neighbors, in any scenario. 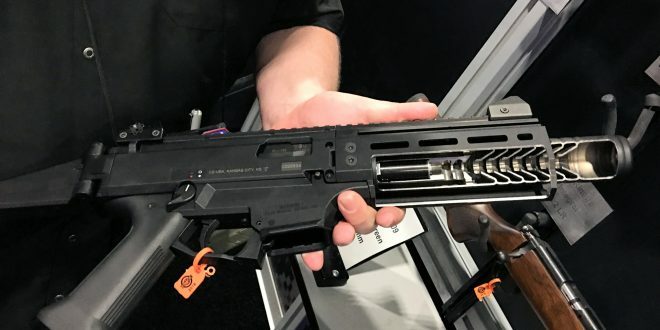 Anyway, getting back to the Scorpion EVO III Micro S2 Reflex’s design, the CZ S2 Ti Reflex can extends all the way back to the muzzle underneath the handguards, allowing for a roughly 10dB (decibel)-quieter weapon over competing suppressed weapons designs. 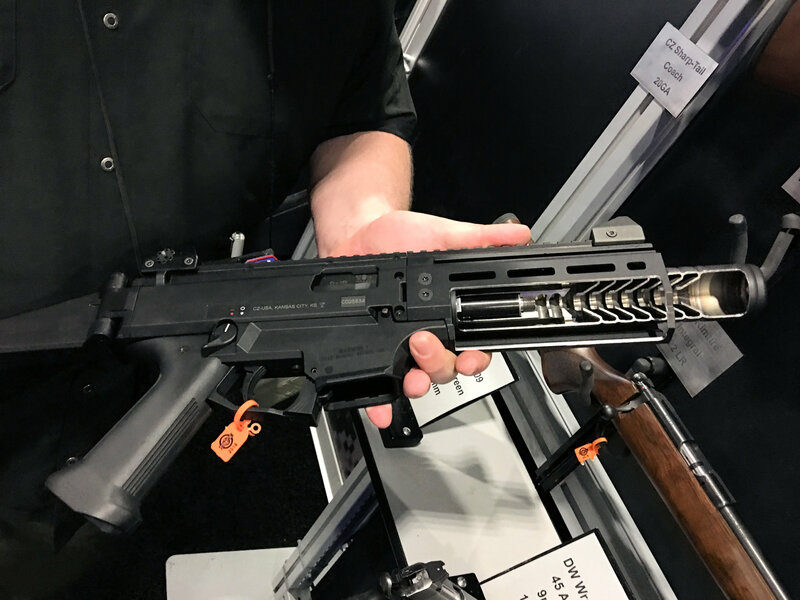 According to CZ rep Zach Hein, the CZ Scorpion EVO III Micro S2 Reflex’s CZ S2 Ti Reflex can “allows for really good suppression. It’s an all-titanium, fully-welded can. There’s nothing to come loose. It’s direct-thread. So, basically [it’s] just stupid simple, reliable, lightweight and robust.” And, since it’s simple blowback, you don’t get any gas in the face. Pretty nice little weapons package. CZ 2075 RAMI BD (Decocker): Big Gun Performance in a Sub-Compact DA/SA 9mm/.40 S&W Combat/Tactical Pistol! Previous: Core Suvival Hel-Star XO K9 (Canine) Military-Grade Multi-Function LED Dog Light Beacon!